Harsco Rail is the largest railroad maintenance company in the Western hemisphere. As an operating segment of Harsco Corporation, we leverage our global footprint and over 100 years of experience and expertise in service of our customers’ most pressing and critical track maintenance and construction needs. Over 125 major railways around the world have chosen Harsco Rail to optimize the condition of their tracks. In recent years, we have expanded our product lines and, in tandem, our geographic reach. Every day, we collaborate with our customers to find finely-tailored, technology-driven solutions to maintain track at peak operating efficiency. The result: lower operating costs, higher speeds and – most importantly – improved safety. Through our four business lines – Equipment, Aftermarket, Contracted Services, and Technology – Harsco Rail is a valued partner throughout the lifecycle of track. From construction, to maintenance, to renewal, we offer the same innovative solutions and world-class service that our customers have relied upon for nearly a century. Enabling TECHNOLOGY IN MOTION is about collaboration with our customers to fully understand their needs and unlocking leading edge technologies to develop innovative solutions that improve performance related to track life cycle activities. Track construction, maintenance and renewal are important life cycle activities that our customers undertake to manage an extremely critical and expensive asset, the track. Harsco Rail is committed to supporting our customers in keeping commerce on track by offering a technology enabled portfolio of tailored products and services from our Equipment, Aftermarket, Technology and Contracted Services business lines respectively. Harsco Rail provides the expert engineering and precise manufacturing that our customers have come to expect. 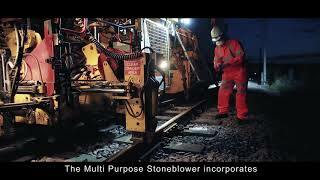 Through our innovative solutions, Harsco Rail decreases downtime on the track, and increases productivity in the field. Protran Technology – a leading provider of modern innovations in the rail and transit industries – offers a suite of products designed to put our clients in control of their unique environments. Designing solutions for roadway worker and bus safety, vehicle awareness, collision avoidance, and track inspection, we give our customers the tools to oversee their own track maintenance and safetyneeds. Individual analysis plans give railroads the ability to inspect, analyse, and perform predictive maintenance on their track – saving both time and money. Additionally, we offer high-quality rail consulting services, state-of-the art technological solutions, track condition assessments, and a variety of rail training courses that can be customized on-site. Harsco Rail provides a full range of parts and service offerings, including OEM genuine replacement parts, on-site technical assistance to troubleshoot and repair equipment, and training programs to minimize machine operating costs. Harsco Rail’s service representatives are deployed around the world for fast, responsive support, and have well over 600 collective years of experience servicing MOW equipment. 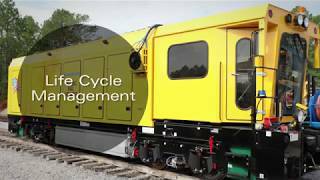 Through Harsco Rail’s Contracted Services segment, customers can secure reliable, full-service maintenance by work crews that know the machines’ operation and upkeep best. Over the last 40 years, Harsco Rail’s Contracted Service teams have covered more than 640,000 kilometres of track, consistently achieving industry leading-production rates and high-quality output.